SIMMS, PATAGONIA, KORKERS, and others have come out with a number of solid products for 2012 that will not only keep anglers’ legs dry, but are designed to keep them standing upright in slippery rivers. We’ll start from the bottom-up, meaning we’ll focus on boots, because this is where the best innovation is happening for 2012. Patagonia has tapped into its mountaineering roots to develop an aluminum-based crampon that clips onto wading boots and improves traction on slick river bottoms. At first glance, we were skeptical, but they work. And Patagonia’s aluminum-integrated “Rock Grip” wading boots grab snotty river bottoms better than you might imagine. Korkers has come out with a new generation of “Svelte,” a synthetic felt alternative, that is more eco-friendly than felt, and lasts longer than its predecessor. The soles fit with the range of Korkers interchangeable boots, including the 2012, Metalhead, which offers a good balance of support and lightness. Chota now offers a good compromise between the hip wader and “Wellie” solid boot, by way of its “Hippies” adjustable wading socks. They’re fabric, so they slide over base layers, but repel water like waders. 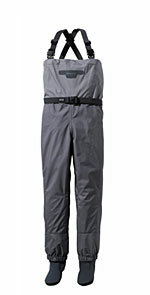 Frogg Toggs expanded its wading line for 2102 with four new products, including the “Pilot” waders that cost $199.99. Redington has introduced Sonic Pro waders specifically designed for women. Our field tests have earned very positive feedback thus far by way of comments on fit and durability. Of course, Simms is out with new models as well. Perhaps most noteworthy are the “Freestone” stockingfoot waders, which are made with Toray fabric, and cost just under $230. 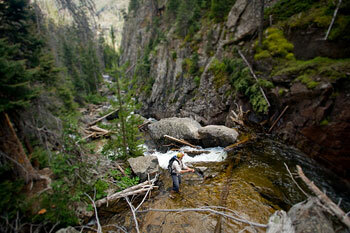 Patagonia’s “Rio Azul” waders are lightweight, packable, and also durable, for $239. In sum, you’ll find two trends in wading for 2012: Waders that cost less, and boots that grab better.